On Tuesday copper for delivery in May advanced to a two-week high on the Comex market in New York at $3.065 per pound or $6,755 a tonne after positive manufacturing data from China, the globe's number one metals consumer. Copper is still down 8% so far in 2018 and the bellwether metal's dimmer prospects is nowhere more evident than on derivatives markets and the shift in positioning of large-scale derivatives speculators such as hedge funds. While continuing to add to bullish gold bets (up 42% over the past week), on the copper market hedge funds have slashed long positions – bets on higher prices in future – to the lowest level since October 2016, back when copper was trading around $2.20 a pound ($4,850 a tonne). According to the CFTC's weekly Commitment of Traders data up to March 27, so-called managed money investors have reduced net longs to just 3,724 HG copper lots, the equivalent of 93m pounds or 42,000 tonnes worth $285m at today's prices. That's a 3.1 billion pound or $9.7 billion decline from record bullish positions held early September last year. On physical markets the indicators are bearish too. Chinese imports of refined copper continued its long term decline in 2018 after falling by 5.7% last year, but on the plus side concentrate shipments have stayed strong. China's copper concentrate imports are on track to top the record levels of 2017 of 17.3m tonnes, boosted by a ban on most scrap imports. However, end user demand may be weaker than the customs data suggest. In a signal of plentiful metal on spot markets, Reuters reports China's top copper smelters on Friday lowered their floor treatment and refining charges (TC/RCs) paid by miners for copper concentrate by 10.3% for the second quarter of 2018. 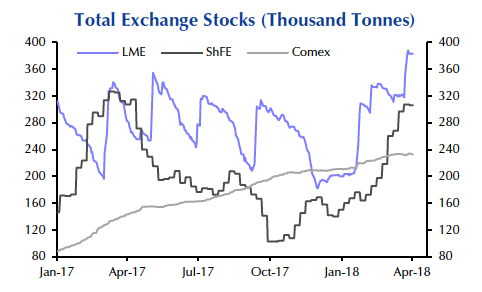 In a note on Tuesday, Capital Economics points out cancelled warrants – metal waiting to leave warehouses – as a share of total inventories in global warehouses on the LME now stand at just 12.8%. Overall LME stocks have soared 90% this year to 388kt last week. Shanghai stocks have also climbed dramatically this year and while cancelled warrants constitute 55% of the metal on the exchange, that's down from 80% six months ago. The London-based researcher predicts that despite the subdued demand picture mine supply and refinery output will rise modestly this year thanks to higher copper prices (copper could be had from $2,500 less per tonne little over two years ago). That said, the copper supply chain is famously susceptible to disruption, notably from industrial action but also increasingly from tighter environmental regulation. Putting together the demand and supply projections, the market looks likely to return to surplus in 2018. But we wouldn’t want to place too much weight on the technical surplus, particularly as it could be quickly wiped out by a supply-side disruption. 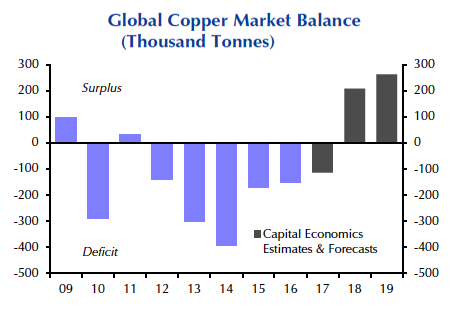 Indeed, in our view, the copper market was effectively in balance in 2017 and will remain amply supplied. Instead our forecast of falling prices this year is premised more on the fact that we think prices moved ahead of fundamentals in late 2017. 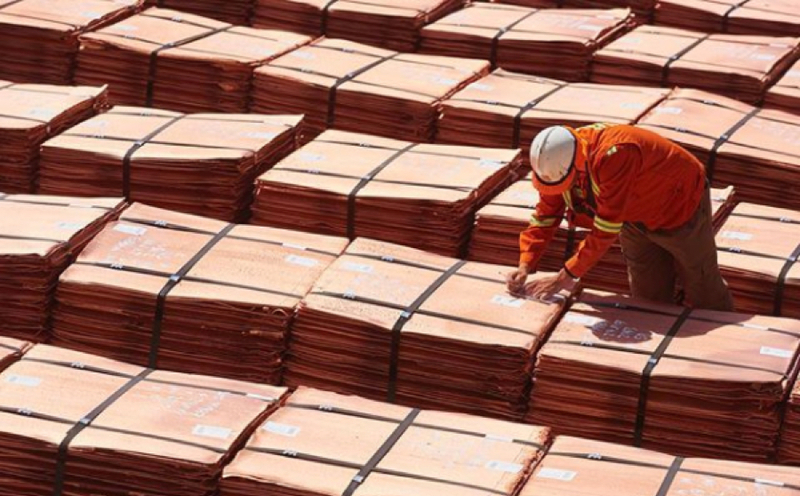 Capital Economics sees copper ending 2018 at $6,500 a tonne or $2.95 per pound. Consensus forecast as compiled by FocusEconomics is for the metal to average $6,835 a tonne during the final quarter of this year compared to the $6,960 average recorded during Q1 2018.